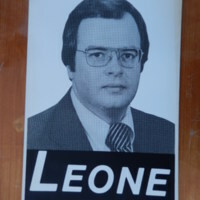 Poster of Republican Tony Leone for his 1977 campaign for Sangamon County County Clerk. He ran against incumbent Gary A. Tumulty who would win the election and go on to serve until 1986. Despite his loss, Leone would have a long career as Clerk to the Illinois House of Representatives as well as other roles in local politics. Campaign poster for Tony Leone during his 1977 bid for Sangamon County Clerk. “Tony Leone Campaign Poster ,” UIS History Harvest, accessed April 23, 2019, http://uishistharv1.uis.edu/items/show/125.